My cake. From a fabulous bakery in NY brought up to CT by Fiance's godmother. FYI, it was as tasty as it looks. Unopened gifts. I definitely got showered with love!! Our car was JAM PACKED on the drive back to DC. Two my college besties/bridesmaids and I enjoying the margs. My shower had a theme of Puerto Rico...also known as our honeymoon locale. A pretty awesome theme if I do say so myself! Me opening one of many gifts - this gift was all for fiance. I don't even like waffles but he INSISTED on registering for a waffle maker. That's okay. 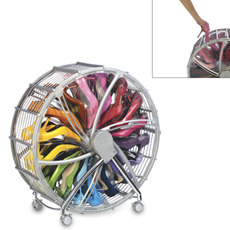 One of my bridesmaids got me a shoe wheel off our registry. It is most certainly a shoe wheel. It fits perfectly in my closet. My bridal party (including the ring bearer!) minus my bridesmaid E who couldn't make it to CT for the event. S'k, she's apparently got her own tricks up her sleeve for the DC guests. Don't mind my droopy straps on my tank top...I was a little tipsy. Those silly margaritas! Now here's my question...so my FMIL hosted my shower - well, the bridesmaids hosted it but she helped. No one from my side of the family was invited. Someone told me "all the women invited to the wedding should be invited to the shower..." Is this true? If so, then I can understand why my step mother (who my mother doesn't really...like) was upset to not be invited but quite frankly, most of my family aren't trekking down here for the wedding so I felt it was unnecessary to extend invitations. Not to mention, my step mom hasn't really been upset about not really being included in the planning till now. Then on Wednesday last week, when I called my father to tell him about the unfortunate event - fiance losing his job - after saying he was sorry he told me that I should send my step mother a note. Apologize for not including her...even though I didn't put together the invitation list. Or any other part of the shower. Seriously? Aside from my mother, and bridesmaids it was ALL fiance's side of the guest list. No one from my side, sans a couple gal pals in Boston, were invited. Why was he making a stink NOW??? I won't get into my personal feelings about her here but I do run hot/cold toward my step mother, and right now? I can tell you I am icy. As in, unimpressed by these shenanigans. Who was invited to your bridal shower? Did you invite all the guests invited to the wedding? Did you have a theme? Favorite gift??? in some circles there is a separate shower from each side of the family... i assume that's what your FMIL was doing too. she probably assumed that someone on your side of the family was going to throw a shower in your hometown, or wherever most of your family is. otherwise, if it's known to the host that this is the ONLY shower, i'm in the camp that they should invite all female wedding guests (not dates or ladies you don't really know, but your friends and family). my shower was thrown by family/MOHs and all female guests were invited, even the ones we knew would not be able to make it. it was the gesture that mattered. I'm sorry you went through shower drama - so did I, but the opposite from yours, my FMIL didn't want to come or invite any of Mr. OBXs family, she thought it was just for the brides side of the family. It really hurt my feelings, even though she did end up coming. about the shower thing.. I haven't had a shower yet so I don't know! I'm actually a little confused because my mom and FMIL threw me a "bridal tea" but only invited a handful of my local friends and one of my fiance's aunts (who lives locally). I don't think it was really meant as a shower, exactly.. I hope not because they definitely left off a goodly chunk of the guest list. I have no idea what my shower is going to look like or who will host - my MOH wants to plan it but she's in Maine so who knows. generally speaking, I always assumed that shower invites would go to all the female guests invited to the wedding (but yeah not dates, just friends and family), whether they could make it to the actual wedding or not. but yeah I guess it depends on who's hosting and how they approach it. sounds like your FMIL expected your side to throw you a separate shower, which is reasonable - certainly by no means is it Your fault your step mother wasn't invited!